Zach Malsom sent in this shot from when he helped out with the Phantom Regiment last summer. 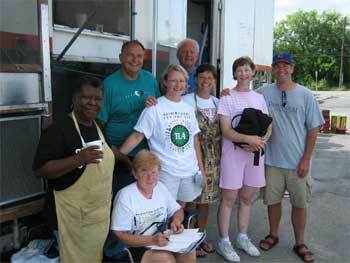 "This is a picture of the PR food crew that was on tour from July 19 to July 25. This was the best group of people I could have imagined spending my "summer vacation" with! Living in Michigan and Illinois my whole life, I always heard about the "dry heat" thing that went on in the South. Well, we got a taste of both the dry heat in Midland, Texas, and the not-so-dry heat of San Antonio. I'll take the dry heat, anytime. Outside the Alamodome, you could swim in the humidity. "From left to right: back row, Ken Janowski, Dieter Orkisz. Middle row: Gail Clemons, Denise Kornegay, Nadine Bowers, Donna Mehrle, me (Zach Malsom). Front row, Barb Janowski. Not pictured: Ann Murphy." Thanks Zach! E-mail your best shots from the summer to dave@dci.org along with where and when the photo was taken. Send some biographical information about yourself as well. We'll give you full credit. Also, let us know if you want your e-mail address included.